Honestly the transformation in Carlos has been incredible..... He pretty much immediately began to show changes from day one - especially towards George. He still barks at people but hardly as much, and he's generally much calmer and quieter. I don't get attacked when I get home, and we have taught him that he is not allowed to jump up at us or go upstairs. We are definitely making progress! He still gets excited during walking but again, if i am stronger and stricter with him he definitely obeys. I can't tell you how much your tips have helped us, it's amazing! "Just a few months ago, my wife and I took on our first dog, a 6 week old Labrador, quite late in our lives. As ‘new parents’ we were full of anxieties and concerns and it soon became apparent that we had adopted a very head strong and determined little girl. My wife in particular was subject to some quite severe ‘play’ sessions resulting in many cuts and bruises. But an early introduction to Lindsay and a handful of one-to-one sessions allayed our tensions. I went to Caroline & Ouzo to try and resolve some fear issues. Namely strangers, noisy, busy places and the car. When out and about Ouzo would cower under tables and behind Caroline's legs. When a car journey was pending he would avoid coming back to her and once in the car would wedge himself underneath the seat for the whole journey and would have to be forcibly removed at the end. "Had the most fantastic day with Ouzo yesterday. On our first pit stop he allowed a small boy to walk him round the cafe car park. Going to the restaurant he trotted along happily tail up along a busy street. In a safe and strange area with people moving about I took him off the lead and he ran about and came when he was called to get back in the car!!! In the cafe a very small child patted him and he was fine. 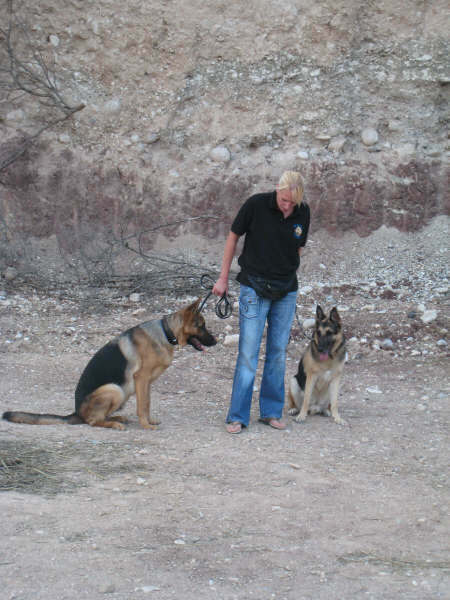 "The sudden death of my husband created unforeseen problems as the stability of our pack was destroyed. My pack consists of me; emotionally very fragile, Sheba, a 12 year old German Shepherd female, who had become very lethargic and withdrawn, and Benjamin, a 1 year old Pointer male, who began howling and chewing when I left the house even for a short time. "Hi Lindsay, All is well in the Marlow mad house. Our dogs are like different dogs now. much more order in the home all thanks to you. I found it very hard to adjust to the new way of living with dogs in the beginning, Having grown up with dogs all my life and having to change my whole way of thinking. But in fairness with a bit of a struggle I did stick to what you said and it worked and still is!!! Josh seemed to find adapting to the new way of doing things with ease and got almost instant results. Lucy has even got better at the vets. We can even get her on the vet table for her normal check ups and annual vaccinations. This was un-heard of, and she would have to be sedated before we could even think about taking her to the vets. Mikey's chewing and destruction is a lot better now too. Now our dogs sit and wait patiently for their leads to be put on before a walk and wait calmly until we are ready to walk out the door after us. They walk very well on the lead without trying to pull us all the way down the road. And they move out of our way if we are passing them and they rarely beg for food now too not even a look in our direction. I hope this finds you well, thanks again for changing our lives and our dogs ones too. The Marlow mad house is definitely a more balanced and happy one since your visit. Just to let you know that the training stuff you showed us when you came over to see us has helped tremendously. It was really difficult at first as the did not want to let go of Alpha Dog easily but the techniques you showed us had an effect within days and we still use them now if the need arises. He no longer jumps up at everyone, when anyone comes in doors he is allowed to say hello and then he moves away, when we go and sit down he leaves us alone and he doesn't keep pushing his way in anymore. 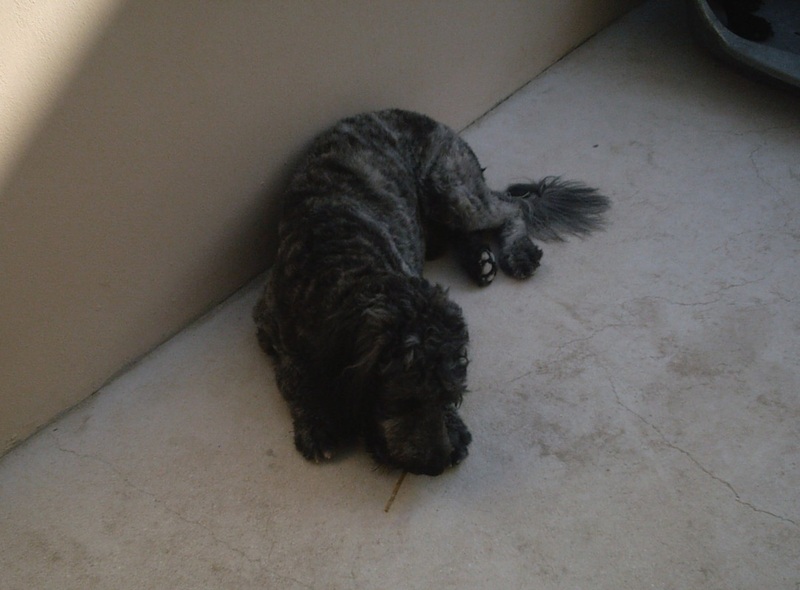 He has stopped running up and down the fence and barking at the neighbours or anything else that moves all the time. He has stopped patrolling around the garden and house and doesn't keep following us everywhere. When the doorbell rings he barks and when I go to answer the door he moves back away from it. He automatically now allows us through doors first and when I come in with shopping etc he moves away so I can get through easily and fully accepts that he goes behind us. In fact all the irritating things he was doing have completely disappeared and I have to say that both ourselves and him are so much happier for it. Thankfully he still barks to alert us if he needs to so everything I wanted to achieve happened. He is now a very calm and happy dog and we do not feel like the days are a battle anymore. Just wanted to say thanks very much for the advice you gave us to solve the issues we were having, I really do appreciate it. I first met Brian, Sheila and Juke back in February 2008. 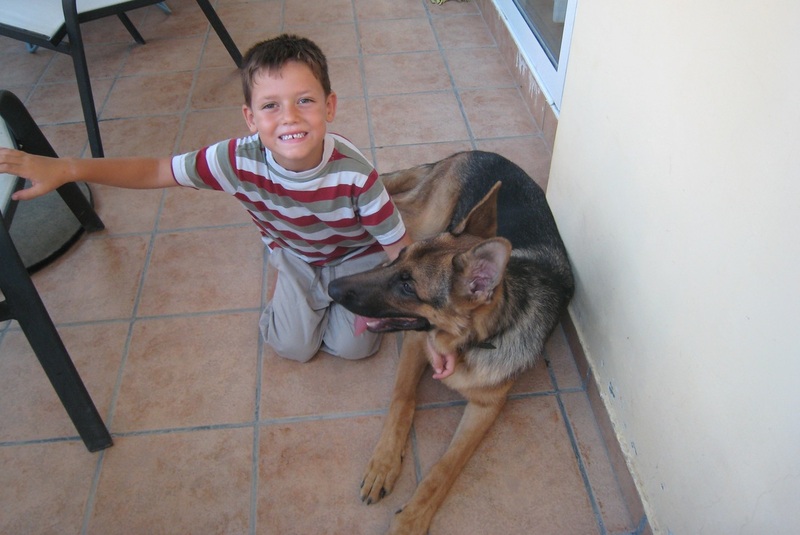 Brian was concerned that since moving to Cyprus his German Shepherd had become aggressive to people and was now showing signs of aggression towards other dogs after an attack from another dog, neither of which he had ever done in the UK, where they had owned a busy pub. It was immediately apparent to me that Juke’s aggression was nervous rather than vicious, however, on that first visit both Brian and I agree that he absolutely would have bitten me if he hadn’t been restrained. We couldn’t have a conversation because he barked and growled constantly and repeatedly lunged towards me. Eventually by muzzling him we managed to quieten him down slightly and discuss his problem and rehabilitation. However, every time I moved, even slightly, he would set off again. I left Brian with a modification programme to follow designed to make Juke feel less insecure, and therefore less likely to act aggressively when feeling nervous. Brian contacted me again at the beginning of June to ask me to come back as he didn’t feel that Juke was improving. Brian had followed the advice given at the first meeting to a T and the improvement in Juke was actually very pleasing. Unfortunately, they still couldn’t have people in the house without muzzling him or putting him in his crate and he was still unpredictable on a walk, barking and lunging at passers by. Worst of all, they had a holiday booked in August which they were going to have to cancel because they couldn’t have possibly boarded him anywhere in his current state. They ended up booking 6 sessions where we would work on Juke accepting me into his house with a view to me being able to take care of him while they were away. By the 4th session I was able to enter the house with Juke loose and un-muzzled and by the 6th and final session he was genuinely pleased and excited to see me. Brian and Sheila were able to go on their holiday with the peace of mind that he was OK. Even the neighbours and their vet commented on the change in his behaviour. So pleased were they with his progress in just 6 sessions that they booked another 6 on their return from their holidays where we tackled Juke’s reaction to various strangers. I called on many unwilling friends and family for this, good job they trust me! On each occasion Juke was muzzled for the arrival of myself and the stranger and then, when I was happy with his body language, the muzzle was removed. And on each occasion Juke got better and better. By the 4th session I arrived with the stranger and instructed that Juke not be muzzled. He accepted the extra person with no reaction at all, and Brian and Sheila were thrilled. They never thought they’d see the day that they could once again welcome a visitor into their home without first muzzling or securing Juke. And I for one was beaming with pride for him! So for the final two sessions I decided to test him. For session 5 I brought two strangers, one of which was male; Juke disliked men the most. Again, he accepted their presence with minimal reaction. And for the 6th and final session I brought THREE strangers with me, two of which were male. And do you know what Juke did? Peed himself with excitement! He was that pleased to see everybody that he actually couldn't contain his excitement. He proceeded to continually approach each visitor in a friendly playful fashion, asking for a fuss. His owners were literally speechless! But they’re not stopping there. Juke’s next challenge is to attend my obedience course. Not for the obedience itself, but for the invaluable social skills that he will learn from this. The end goal being that the other owners and dogs can approach him and fuss him, and that Juke will actually enjoy this attention rather than be afraid of it and react aggressively. I am absolutely thrilled with Juke’s progress in just 12 weeks and have absolute respect for Brian and Sheila who never gave up on him, were prepared to put the time and the money in to make him better and followed every scrap of advice I gave to the letter. We all agree that Juke would have bitten somebody sooner or later had he carried on the way he was going, but if he carries on progressing at the speed he is, Brian and Sheila will be enjoying a perfectly normal and happy German Shepherd, just like the dog he used to be in the UK. Juke's acceptance of people is now almost back to normal thanks to other class members approaching him confidently and fussing him, so then we focussed on his canine aggression. Below are some photographs of Juke's progress at the end of his obedience course. He's walking happily, tail wagging, un-muzzled and with a loose lead, with another dog of the same size and sitting calmly not two feet away from him. This is real progress for the dog who couldn't get within 10 feet of another dog without going crazy to get to them. He continues to improve every week and everyone's very proud of him. I was introduced to Oscar – a German Shepherd dog – when he was just over three months old and his owners, Vassos and Sue, asked for my help in training him. He quickly grew into quite a character, and their list of woes was long and predictable. Then one day they told me about their five-year-old neighbour, Little Jack, who had always been a welcome visitor and needed only to climb over the wall to call on them. Jack thought Oscar was wonderful but, as Oscar got bigger and bouncier, he became increasingly nervous of him and would try to run away – which Oscar thought was a great new game. Very reluctantly, Sue suggested to Jack’s mother that perhaps it would be for the best if Jack didn’t come over the wall for a while, until Oscar was a bit older and calmer; they didn’t want Jack traumatised and the story ending in tears. Luckily they ran this theory by me and I told them that, infact, the opposite was true. They shouldn’t avoid the problem, but address it and deal with it. Treat it as part of Oscar’s training. I gave them the advice they needed to carry this out and Vassos & Sue embraced the idea and explained what needed to be done to Little Jack’s mum. Everybody was very happy and relieved with the suggestion. Oscar is now seven months old and everything has turned out perfectly. Both families are thrilled that the kids can carry on jumping over the wall to visit whenever they want without having to worry and, as you can see, Oscar and Jack are now firm friends. Scruffy came to me for 5 days residential training to solve his pulling problem. His owners are both retired and were finding it difficult, if not impossible, to control him on walks. The final straw came when Scruffy dragged not one, but both of his owners, into a busy road and literally pulled them both flat on their faces. This was now becoming dangerous and something had to be done. The first time I met Scruffy he pulled me so badly that I was left with blisters on my hand from the lead, the problem really was that serious. Within three days the improvement was incredible and by the time he went home Scruffy walked calmly on the lead, responded to my commands and looked to me for guidance, instead of getting his head down and dragging ME to where HE wanted to go, which was his normal behaviour. Suffice to say his owners are thrilled and continue to note improvements in him, not only on his walks but within the home aswell. I was called to Bonnie and Foxy by a very desperate owner who could no longer have her two dogs in the same room together. 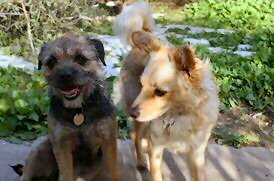 Bonnie is a four year old Border Terrier and Foxy a one year old small cross breed. Previously they had been the best of friends but once Foxy reached social maturity Bonnie decided it was necessary to make sure that Foxy understood her place in the pack and continually tried to put her in her place. However, the fact that they were so equally matched in temperament and size meant that Foxy wouldn’t back down to these assaults, resulting in fights so aggressive that by the time I met them they were kept in separate parts of the house and garden, fed separately, given affection separately and walked one at a time. Their owners, Debbie and Tristan, were at their wits end and had already decided that if my advice didn’t work then Foxy would have to be re-homed. The idea of that was clearly distressing to them but things were so bad they really felt like they had no other choice. I met Bonnie first and it was very clear from the outset that she ruled the roost. She constantly showed dominance over both Debbie and Tristan, and once Foxy was introduced to the room she became instantly tense and aggressive. The second their eyes met they would lunge towards each other attempting to have a fight (obviously this was all carried out in a controlled environment to ensure nobody, including us humans, got hurt). There was a real intention behind these attacks and had they been loose they most certainly would have done damage to one another. Having assessed the dogs and the problem I left Debbie and Tristan with a modification programme to follow. First of all they had to tackle Bonnie’s dominance. As long as she thought she was the top dog, no amount of correction from her owners would have worked because she didn’t view them as people who had any authority over her. Only when Bonnie knew her place could they move onto the second stage of the modification programme, which was tackling the fighting itself. Although Bonnie was the instigator of the fights, Foxy responded without hesitation so the programme covered rules for both dogs, not just Bonnie. Less than a month later Debbie sent me by email this photograph. As she put so well in her email ‘a picture tells a thousand words’. 4 months later I received this update from her. "Just thought you might like an update on how Bonnie and Foxy are doing, they're now the best of buddies and I can't remember when they last had a fight which is great. I think Foxy has accepted her position at the bottom of the pack as a couple of times Bonnie has been let in before Foxy has finished her food but she just walks away and lets Bonnie polish it off. They're also fine when they're off the lead. We had visitors stay the other week and there wasn't a problem there either!"